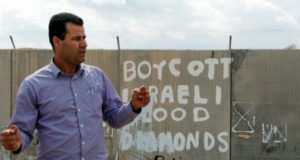 For 28 months, Palestinians from the West Bank village of Bil’in have been joined by Israeli and international solidarity activists to non-violently protest the confiscation of Palestinian land and Israel’s Apartheid Wall. Today, before reaching their destination at the Wall, the Israeli army set up a roadblock of razor wire, separating the protesters from the Wall. As demonstrators crossed the razor wire, Occupation soldiers started to throw tear gas and sound grenades. 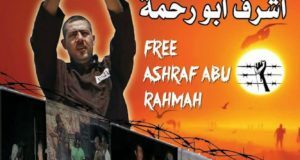 Immediately, Israeli soldiers kidnapped Mohammad Khatib of the Popular Committee Against the Wall and Settlements. As more activists arrived at the scene, soldiers became more aggressive and started to push and hit people, including camerapersons and activists. Iyad, from Bil’in, was kicked in his groin by an Israeli soldier. Iyad fell to the ground in pain. Soldiers hovered above him, preventing other activists from helping, until another soldier took a tear gas canisters and threw it towards Iyad as he lay on the ground. 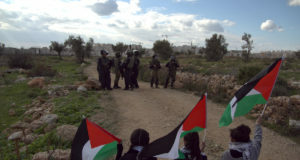 Soldiers continually fired tear gas until most of the demonstrators retreated into the field of olive trees. Palestinian medical relief workers loaded Cristian onto the stretcher and tended his wounds. Issa Mahmoud and Ibrahim Bornat, two other Palestinian activists, were also wounded by rubber bullets, Issa in the leg and Ibrahim in the arm. After regrouping, demonstrators made their way to another location in the Wall. Soldiers redirected their attention to this small crowd of activists, and started to fire rubber bullets and tear gas in their direction. One tear gas canister managed to created a small flame. This then grew into a large fire and quickly spread about 150 meters towards the olive grove. Activists could be seen attempting to extinguish the growing flame with branches of leaves. خرج أهالي قرية بلعين اليوم بعد صلاة الحمعة في مسيرة حاشدة وقد شارك فيها مجموعة من المتضامنين الدوليين والإسرائيليين ، ورفع المتظاهرون اليافطات المنددة بالاحتلال بالإضافة إلى الأعلام الفلسطينية، وقد جابوا شوارع القرية وهم يرددون الهتافات المنددة ببناء الجدار والمستوطنات ،وعند اقترابهم من منطقة الجدار حيث كان الجيش مكمنا هناك، وقد منع المتظاهرين من عبور الأسلاك الشائكة التي وضعها على الشارع المؤدي إلى الجدار وهدد باطلاق النار على كل من يجتازه ، وحين محاولة المتظاهرين العبور بدأ باطلاق القنابل الغازية والصوتية والرصاص المعدني المغلف بالمطاط ؛مما أدى إلى إصابة سبعة متظاهرين بينهم متضامن دولي من اليونان يدعى كرسيان، أما بقية المصابين فهم الطفل طلال مصطفى الخطيب ،إياد برناط رئيس اللجنة الشعبية ، عيسى محمود عيسى أبو رحمة، إبراهيم عبدالفتاح برناط وشقيقه راني ، سمير سليمان ياسين . من جهة أخرى تم اعتقال ثلاثة من أعضاء اللجنة الشعبية وهم : محمد الخطيب ،راتب أبو رحمة، عبد الفتاح برناط ، حيث تم احتجازهم لعدة ساعات قبل الافراج عنهم وقد تم وضعهم تحت أشعة الشمس الحارة . هذا وقد داهمت قوات الاحتلال يوم أمس الأول القرية وقامت بتفتيش منزل هيثم الخطيب واعتقلت شقيقه سعد محمد جمال الخطيب (24)سنة . من ناحية أخرى ونتيجة استخدام الجيش المفرط لقنابل الغاز المسيل للدموع تم احراق عشرات الدونمات المزروعة بأشجار الزيتون التي تعود ملكيتها لكل من : محمد إبراهيم أبو رحمة ، صالح الخطيب وابنه فيصل .